Most of you have already read about the latest fad today - yes you're right - it's juicing. There have been many written articles about the benefits of juicing. It not only detoxifies our bodies of toxins and impurities but also helps lose weight. One problem I could see with juicing is that it is too tasky for working moms like me to make my own juice. Imagine you have to shop for veggies, clean them, juice them and then clean your juicer of course. Another thing is that you have to have a high quality juicer for this to work! I tried juicing with my cheap (haha!) juicer and it just ended up in a mess. It didn't do the job. As I really wanted to try this, I consulted Mr. Google to find out if there is anyone who delivers ready made juices in Abu Dhabi. To my surprise, there is, but to my bigger surprise the prices are very expensive. I really couldn't afford it. 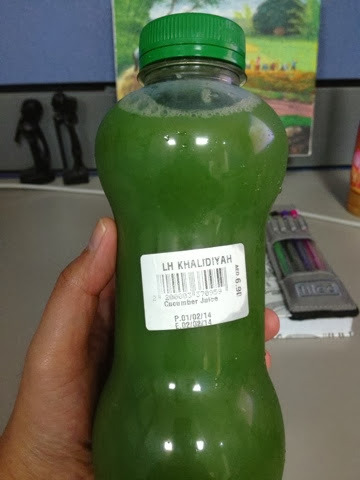 For three days of juicing, it would cost around AED 1000, and that was it - I gave up my hopes in juicing. One day while I was doing my weekly groceries at Lulu and while I was at their vegetable section, I saw an advertisement stating that Lulu is now offering fresh vegetable juices. I checked it out and saw that there were a lot of flavors to choose from. They have cucumber, beetroot, carrots, etc. To my surprise, a bottle of juice costs around AED 6 to AED 10 only! I was really happy as I found my fuss-free juicing. The next thing for me to find out is which flavors are yummy, and which ones are not.